The Mayan Palace has resorts in Acapulco, Cancun, Nuevo Vallarta, Puerto Vallarta, Puerto Penasco, and Mazatlan. 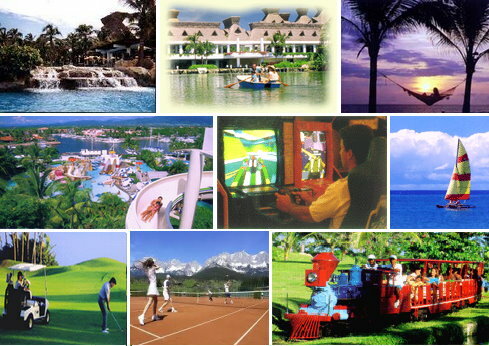 These are exellent places for a family vacation. The Mayan Resorts generally have 50 to 200 acres of land. There are lots of activities right on the resort including a large swimming pool, lake, ocean beach, water park with slides, fountains, paddle boats, kayacking, game rooms, tennis, and golf. Horseback riding, quad rentals, parasailing, etc are offered on or near the beach by outside vendors. The Mayan Resorts also have lots of scheduled activities such as children's camps, children dances, children karaoke, volleyball, pool games, special dinners, dancing, and other scheduled evening events like Mexican Fiestas, etc. There are several restaurants, including buffet style dining, at the resort. Some of the rooms include a full kitchen with refrigerator, stove, dishwasher, and microwave. There are food, general, and gift stores on the grounds as well. The Mayan Resorts are generally close to the major tourist activites in each of the respective locations, so there is lots more to do outside of the resort. Things like sightseeing, guided tours, shopping, museums, dolphin swims, fishing charters, boat tours, more restaurants, and a robust night life. Prices in Mexico are extremely reasonable compared to the US. We use the following process to check availability and make reservations at the resort and to match up your request with a timeshare owner that has an available week for rent. Please keep in mind that since the Mayan Palace is a timeshare resort and units are rented by timeshare owners only, check-in days are on Friday, Saturday, or Sunday only and for stays in seven night increments. These procedures are designed to conform to resort policies and to protect both the timeshare renter and timeshare owner from financial loss. The reservations on these go quickly and are subject to availability at the point you contact us. You make a $100 (USD) deposit to our PayPal account by clicking on the "Request" button. Mexico's climate is less variable and warmer than it's neighbors to the north. The main factors in Mexico's climate variation is that of its topography and its position between the Pacific Ocean and the Gulf of Mexico. More than half of the country is also mountainous with major ranges in the east, west, and south of Mexico City. Bordering the Gulf of Mexico are lowlands characterized by hotter, more humid climate than the higher elevations of the country. The coast and lowlands are hot and humid all year. The interior highlands are milder and drier, but can become freezing between December and February. Rainfall is scarce throughout most of the country. Rainy Season: May through October except for the northern region which is primarily a desert. Coolest Months: December through February, except the Yucatan Peninsula (Cancun) which is always warm and temperate. Hurricane Season: The same as the southern US, i.e., June through October. Strong storms can affect weather on both coasts. Click here for detailed weather by region. The Mayan Resorts have two bedroom, one bedroom, and studio units available for rent through timeshhare owners. The buildings are laid out so the the front of the rooms and balconies all face the water (Ocean or gulf). The back of the rooms open to an open air hallway through a secure door. The open air hallways usually overlook the golf course, lake, or mountians. The 2 BR unit sleeps 8, two privately in the master bedroom on a king size bed, four in each of the two double beds in the second bedroom, and two on a queen size sofa sleeper. The unit contains two full bath rooms, a kitchenette, dining area, and living room. The 1 BR unit sleeps 4, two privately in the bedroom and two in the living room on a queen size sofa sleeper. The unit contains one full bath room, a kitchenette, dining area, and living room. The studio unit sleeps four, two in each of the two double beds. The unit contains one full bath room, and a small living area. Some studio units contain a queen size bed that sleeps two and a sofa sleeper in an enlarged living area. The Mayan Resorts refurbish the rooms every five years so they are generally very clean and in excellent condition.